Among those who dislike or hate doing their taxes, most cite the hassles of the process or the amount of time it takes: 31% say it is complicated, requires too much paperwork or they are afraid of making mistakes, while 24% say it is inconvenient and time-consuming. A much smaller share (12%) says they dislike doing their taxes because of how the government uses tax money. Just 5% of those who dislike or hate doing their income taxes say it is because they pay too much in taxes. Overall, people with lower incomes are more likely to have a positive of view of doing their taxes than those with higher incomes. About four-in-ten (41%) of those with family incomes of less than $30,000 a year say they like or love doing their income taxes compared with 30% of those with incomes of $75,000 or more. Blacks are far more likely than whites to say they like doing their taxes (52% vs. 28%). Democrats have a less negative view of doing their taxes than do Republicans or independents. 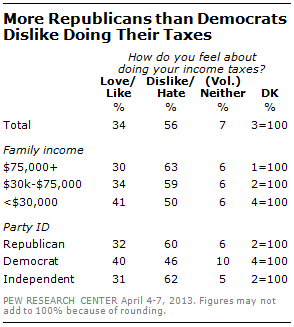 Six-in-ten Republicans (60%) say they dislike or hate doing their taxes. Just 32% like it or love it. The balance of opinion is similar among independents (62% dislike or hate it, 31% like or love it). Democrats’ opinions are more mixed: just under half (46%) either dislike or hate doing their taxes, while four-in-ten (40%) like or love it. Overall, a third (33%) of Americans say they do their own taxes while 56% say someone else prepares their taxes. About six-in-ten (61%) of those who say they hate or dislike doing their income taxes have someone else do it for them, compared with 52% of those who say they like or love doing it. 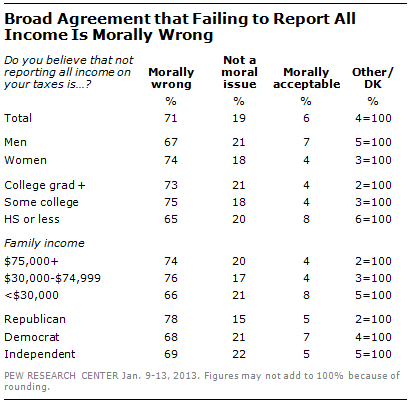 This is down slightly from February 2006, when 79% said that not reporting all income was morally wrong. Republicans are more likely than both Democrats and independents to describe not reporting all income as morally wrong – 78% of Republicans say this, compared with 68% of Democrats and 69% of independents. There is almost no difference among partisans who say that not reporting all income is morally acceptable – rather, Democrats and independents are more likely to say that it is not a moral issue. Across all demographic groups, majorities agree that this is morally wrong. However, those with less educational attainment and lower family income are less likely than those with college degrees and higher incomes to say this. About two-thirds of those with a high school diploma or less (65%) or incomes below $30,000 (66%) say that not reporting all income is morally wrong, compared with about three-quarters of those in higher income and education groups. Interactive: How Do Americans Feel About Doing Their Taxes?